The most popular place to climb at Mapoutahi. Make sure you wear a helmet and watch for loose rock. The area around Winona's is a major drainage line that comes down off the railway corridor above and can form into a pumping waterfall that leaves the adjacent routes drenched for days. Launch onto the rock off the top of the boulder at ground level to the right of 'Control' with a few delicate moves to a ledge. Up the groove until forced out onto the face beneath the bulging arete. A couple of power moves into the crack takes you to the chains. Bolted by Steve and given as a gift to Dave. Start as for GG2 then swing out right onto the golden slab. Crimp your way to glory up the steepening wall! The L facing corner. Originally finishing at the top of the pillar it was extended to the top of the corner in 2012. Natural pro optional up initial crack. The lower section was retrobolted when the Death Block fell out in 2017. Up the resulting left-leaning groove and pull over onto the ledge out right. Now power up the arete above. Retrobolted after the Death Block fell out then led by Sam. Crimp your way up the wall onto the slab and finish in the corner. Heads up a nice water-worn wall. 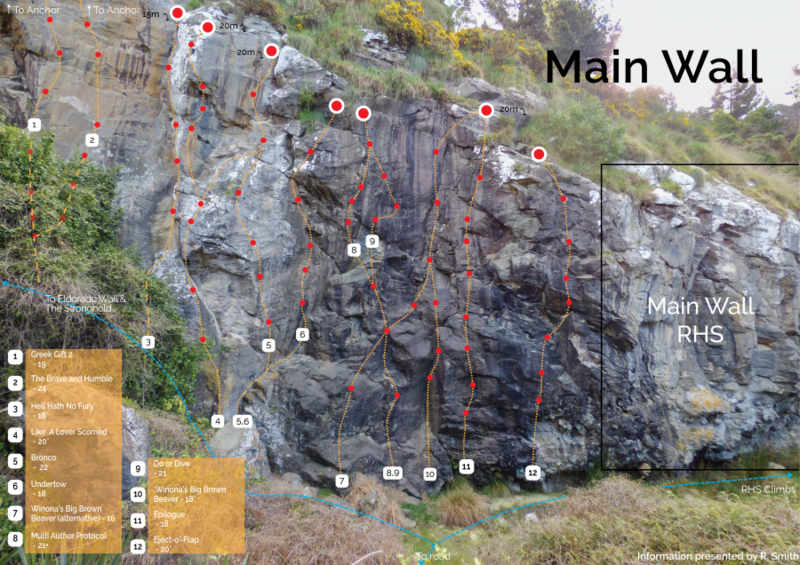 An alternative start is to traverse right onto route above the steep crux at the bottom: start from 2 routes to the left to clip bottom bolt, traverse immediately right to next route; climb on this sport route to the obvious weakness to the right. Place small cam (optional) and tenuously traverse right, ending up near 3rd bolt of WBBB. Others have traversed into the route from the route just to the left of WBBB, using a traverse below the 3rd bolt and no gear. You may want a large cam for the final crack at the top of the route, although there are smaller placements lower down. A steep and powerful combination on good rock. Start up Undertow until you can step right onto the big sloping ledge at half height. Then climb straight up the steep wall above until you can join 'Do or Dive' at it's last bolt. A great route up the steep and solid wall left of Winona's. Climb easily up to the mid-height ledge, then balance up and right onto the nose. From here, commit to an awesome sequence of crimps, slopers and jugs that diagonals leftwards across the steep upper wall. Pumpy start to reach high and pull through the crux, and then eases off before a slightly steeper finish. Some cams can be placed to protect the top crack above the last bolt. Crimp your way up the steep wall. A few jugs thrown in for good measure. Conceived and drilled by Calum Hudson who passed away before getting the chance to finish his project. Some powerful moves with a couple of reachey clips. Sharp holds down low. Use DS rap station on the left. Only one hanger left on the route. Alternate start on left to avoid chossy overhang. Just right to EF, sharing first bolt. Beware potential ground fall before clipping second bolt (very easy climbing though). Short technical brainteaser near the top. Drilled by Steve, gifted to Maud. Nasty, slippery rock to the first bolt. Not worth it. A crackline hidden in a corner in the centre of the wall. Surmount a small pillar at the base of the corner and launch up the crack. A range of cams will see you right. Somewhere R of Friggin Hell, starting at the high point of the ground and in the main apex of the cliff is ‘an excellent route’ which goes to the top of the cliff to another waratah belay, now overgrown with gorse. Could do with a DBB. Starting up what was formerly 'Star Spangled Spanner' on the right hand edge of the Eldorado Wall, this route has been retro bolted on the lower section and now continues to the top of the cliff with the addition of several more bolts making it the longest route on the cliff. Superior variant of Kaos. The " 'unprotected L slanting groove.....' - Dave Brash, Dunedin Rock, 2000" - has now been retrobolted. From the wedged spike at the top of the initial corner, launch out right across the void then up the striking golden corner. Power over the bulge on manageable jugginess. Not many grade 17 routes around of this length and quality of rock architecture. This central line on the Eldorado Wall has been retrobolted, now going to the top of the cliff via a crackline through the upper bulging wall and finishing at the Firewalker belay. The groove immediately above the spike on Golden Showers was originally climbed by Michelle Jospe who thought she was on Golden Showers. Steve Carr extended the route to the top of the crag shortly after. From the top of the groove step left onto the ledge then up the blunt arête into the rock scar and rock over onto the hanging slab. Immediately left of Teardrop Arete at Mapoutahi. Climb the pillar in the corner, move rightwards across the wall, then straight up overhanging terrain to finish on the same lichenous slab as Teardrop Arete. . Climb the L slanting groove to the wedged spike. Take a line rightwards under Golden Showers corner and around onto the face. Great climbing on excellent rock up to a high belay. It would be a shame if you were put off by the statement in Rock deluxe that this route has the worst rock of the crag because then you'd miss out on a great route. Sure, one or two of the holds are friable, but the bolts are all good - one of the best at Mapoutahi. The big corner immediately left of Fire Walker. Holds quite a lot of interesting climbing. Up the corner from the pillar, then L onto the face past the third bolt. Control has been recently retrobolted. The belay has been relocated to the very top of the wall above three newly positioned bolts. A further bolt has been added on the left hand side of the starting pillar. Located in the centre of the main wall at Mapoutahi. Approach from the left hand end walking under The Jolly Cobbler Wall. Surmount the detached block to reach the first bolt. Swing left at the top onto the white lichenous slab for an engaging finish!! All natural pro corner to a DBB at 15m. Good pro. Begins off the top of a pillar in a high corner. Clip two bolts to get the business going. At the top of the corner the old chains have been removed and substituted with a bolt runner. The new ring belay can be found just over the brow of the arête above and to the left. Bring a helmet and beware loose rock, as many routes are new climbs and quite hard for their grades. That said, there is some excellent climbing and the crag is cleaning up nicely! Some gear can be handy at times, but most of the climbs are well protected by bolts, if a bit reachy.